Less than two years ago, The International 7 was the debut for OpenAI's Dota 2 project - an AI that iteratively learned Dota by playing against itself for tens of thousands of hours. Now, in just a few days, Dota players around the globe will have their chance to play against the latest iteration of OpenAI development. Where did OpenAI come from? OpenAI is a company of about 100 people based in San Francisco whose mission statement is to "ensure that artificial general intelligence benefits all of humanity." With this in mind, they started looking for a game that would simulate complex real time decision making based on limited information. Members of the project eventually had to decide between Starcraft and Dota, settling on Dota as the model for their AI development. The eventual goal for AI is to use them to solve complex real world problems - so Dota 2 as a development model provides several useful tools. A Dota game requires teamwork, variable item and skill builds, movement decisions, and players must play with limited rather than perfect information. For example - in a game of chess, both players can see the entire board and knows everything their opponent is capable of. In Dota, we only know what our teammates and limited map vision tells us. We (and eventually the AI) must use this information to make a 'best guess' about the best decision moving forward. OpenAI has come a long way from decimating the pros at 1v1s at TI7 (although it can probably still do that.) The premier of the classic SF vs SF with a surprise appearance by Dendi made the crowd go wild as the bot had perfect cs and ferried out non stop region. That show match had far reaching impacts on the pro meta, with players realizing that non stop regen can help dominate a lane. If mangoes had a market value, we would have seen it skyrocket. Fast forward to the next Summer, when OpenAI took on their first Team Human made up of Blitz, Capitalist, MoonMeander, Merlini, and Fogged. The world watched closely as five bots took on five high level human players. We had seen the laughable bots programmed within the game, surely five people working together could beat five bots with no intuition? Turns out, not a chance. If the bots were allowed to draft, they crushed the humans. Four man lanes at three minutes in, random smokes, BM all chat - it looked like a real human infested pub. Except the bots won every fight again and again. The humans couldn't find a moment to breathe and were crushed by OpenAI's superior experience. After all, these bots had played exponentially more hours than anyone on team human! Fortunately for humans, Skynet wasn't quite ready to take over. Professional teams at The International 8 fought for humanity with pre-determined drafts of equal win probability. They were still able to beat the bots. Until today. Today TI8 champions OG were crushed in a swift 2 - 0, with no chance to come online or put up a fight. In all fairness, OG isn't the strongest early game team and often relied on mid game strength and comeback at TI, but the improvement in the AI is remarkable. How to play against OpenAI? Think you can do better than OG? 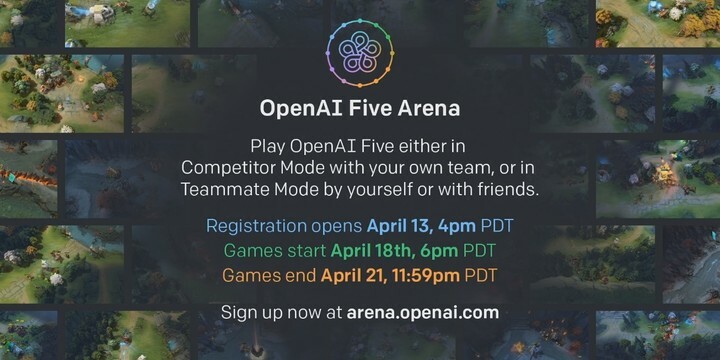 The developers will be opening up OpenAI (hah) to the public from April 18th - April 21st. You can play with a team, with the bots, or with other humans against the bots - just register HERE to make sure there will be servers available. The most interesting question will be: what will the pro players learn from the latest OpenAI bots? And who will use it to be the next champion?